Although the summer holidays have finished with the August’s month for a lot of people, for other ones, who have suffered the hot weather in the work place while they saw how the work mates departed to remote countries, the good time starts now. Barcelona is not going to disappoint all the people who have been waiting for the arriving of their well-deserved vacations. On the contrary, the activity of the city is not going to let anyone to get bored. From refreshing ridings through the beach by bicycle, to the challenge of getting to the top of the hill of Montjuïc, where you will be awarded with the amazing views of the city. Everything with the nicest weather and avoiding the July and August build-ups –overbooking in hotels, in restaurants and, even worst! in the streets-. And, if it was not enough, we cannot forget that the great fiesta of La Mercè 2018 is very close. A festivity that, as always, will get you closer to the culture and tradition of the city. Barcelona is waiting for you with open arms, take your bicycle and come to pedal! These last days in Barcelona, the temperature has increased, so, here you have some tips about how you can take advantage of this moment pedaling a bicycle. Appetizers, soft-drinks and a bicycle is our recipe for the warm days in Barcelona. Spring always invites us to carry out some activities and Barcelona is full of opportunities for enjoying every minute of a day. Today’s tip is that you should concentrate on the city’s gastronomy. One referring to the sea and the mountain. There is a great variety of tours in Barcelona, but, if you feel like it, we can start by talking about beaches. An outing by bicycle through the promenade, stopping for a quick dip (this is only for the most courageous), has to be compensated by some tapas (Spanish appetizers) in more than one of the different bars and restaurants of this zone. In addition, by pedaling only 5 minutes, you can go to the center of the city, where you will not be disappointed. And, from enjoying some fish and shellfish to the “pa amb tomàquet” (bread with tomatoes rubbed on it) with some home-made croquettes, some cold meat, olivada (an olive pure) or whatever you prefer. In Barcelona, the combination of flavors and textures is infinite, because, besides the local gastronomy, a lot of restaurants and bars bet on incorporating products from many other cultures. So, now you know that, after some important pedaling, you have to recover energy! This Easter Week say goodbye to the umbrella and prepare yourself for a tour through the activities in Barcelona with your bicycle. Here are some suggestions. Barcelona is a beautiful city because of its beaches, its architecture, but, also because of its parks and gardens distributed through different points of the city. One of our favorite parks is the Parc de la Ciutadella. By bicycle or walking, this lovely and immense park, in the center of the city, is one of the most passed through parks. But, if you feel more courageous, you can go to the Laribal’s Gardens by bicycle, in the district of Sants-Montjuïc, away from the center, but with incredible views. And, in order to close the triangle, in the other extreme of Barcelona, we have the Horta’s Labyrinth, the oldest park of Barcelona. Pedaling through the Passeig Maritim, you will enjoy the tranquility of these days at the beach. Although you could think that this is a perfect destination for summer, these days the beach is also beautiful and very, very calm. So, it is one of the best moments to enjoy its breeze. From the beach to the center is a nice pedaling experience by bicycle, without hills and full of bars and restaurants where you can rest, refresh yourself and eat some tapas –the typical Spanish appetizers-. But, if we are talking about eating during these days, above all, you shouldn’t miss the famous Easter “mona” cake. Although it is supposed that it has to be a present for our godsons and goddaughters, these cakes are delicious and this is a dessert that we should enjoy. It is normal that, during these dates, we relate the bike routes with the forests and mountains. Although, we love to remember that, during November and December, beaches, less visited than during summer, are the perfect option to ride our bike and find a bit of calm. Barcelona, as we like to remember, is a sea and mountain city. Just riding your bicycle, you can go from Montjuïc -and its amazing views- to the beach in an easy way. Why don’t do that during winter? If during summer the beaches of Barcelona are the meeting point of millions of tourists who visit the city, during November and December months, this coming and going of people becomes calm and tranquility for all the people who dare to go there. The bike lane, parallel to the promenade, goes through all the beaches of the city, a fact that become itself in a perfect route to enjoy the landscape and the sea breeze. We can pedal during a long time since we decide to stop and rest. Then, we can lie down on the sand -of course, remember to take something to wrap you up warm- and focus yourself in the swell sound. ¿Haven’t you feel like to experience something like this? For us, who are very close to the beaches, this is the best you can do for relaxing yourself and disconnect from the frenetic rhythm of these days. Barcelona is a city with a Mediterranean weather, which means that its temperatures are not extreme, on the contrary, are perfect for moving around pedaling. Even so, during summer, the best we can do is ride the bike close to its beaches, just in cas the warm weather gets too hot and we need a swim. During summer, in Barcelona, the temperatures can exceed 30ºC. For this reason, our tip is to keep yourselves hydrated at every moment and to look for fresh places. And, which is the best way of refreshing ourselves than with the fresh water of the beaches? The different beaches of Barcelona are perfectly connected, and to ride from one to another by bicycle is very easy and safe. With a tour through the beaches you will be able to enjoy the sea breeze and stop to cool yourselves off whenever you want, because you will be able to park your bike easily. In addition, this zone is full of bars and restaurants, where you can stop for drinking a beer -remember that a bicycle is also a means of transport, so it is better to drink in a moderate and responsible way- with its corresponding tapa -Spanish appetizers-. For making the best choice, let yourself be guided through the different aromas. Without a doubt, for us, this is the best way to enjoy the summer holidays. Which are your plans for this long weekend during Easter? In Barcelona, you have a lot of offers related or not to this festivity that you shouldn’t miss. From the Easter workshops for all ages in community centers and museums, to the long pedals through the beach and the mountain by bicycle. In Barcelona you can do almost everything during this weekend. Are you the whole the family? Go to some of the workshops, such as the CosmoCaixa, or the Chocolate Museum, or the Fundació Suñol. Maybe you are thinking about something for couples. A pedaling by bike from the beach to the Montjuïc Mountain, enjoying nature and landscape, could be the best plan for you. And for the other ones that prefer going out with friends, the best you can do is enjoy some tapas (Spanish appetizers) in the center of the city. 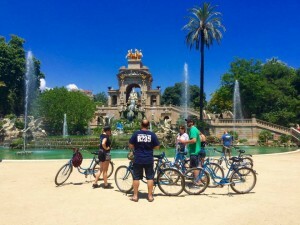 With this kind of plans it is unavoidable to love Barcelona, but the part that we really love is that you can do every one of these three routes by bicycle. In this way we contribute to a more healthy tourism, in harmony with the city and the people who live here. Experience Barcelona in the same way that we do! Do you only have a few hours to enjoy the city? Choose what most interests you. Gastronomy is a basic element of the Mediterranean culture. Passing through Barcelona and not stopping at one of the bars to have a drink and an appetizer is almost a sin. A route by bicycle near the harbor and the beach will open our appetite in order to enjoy the traditional Catalan cuisine. It’s one of the best mementos of the city that you can take with you. If what most interests you are the visits to Barcelona, a perfect route for you is the one that takes you from the beach through the harbor and to the heights of Montjuïc. Barcelona is one of the few cities that allows you to enjoy these two types of landscapes at the same time. Therefore, take advantage of it! If what you like is getting lost in the streets of the city and discovering its architectural jewels, this is your route. A great part of the activity of the city is carried out in these buildings, so you will find the majority of them in the most centric zones. Have you decided which route best fits your tastes? What should you keep in mind before doing a tour through Barcelona by bike during these summer’ holidays? During the summer, you can visit Barcelona in a thousand different ways. We want to give you some options, riding your bicycle, with which you will enjoy the hot weather. 30ºC of temperature (86ºF) can be a bit suffocating, especially if we are riding a bicycle. 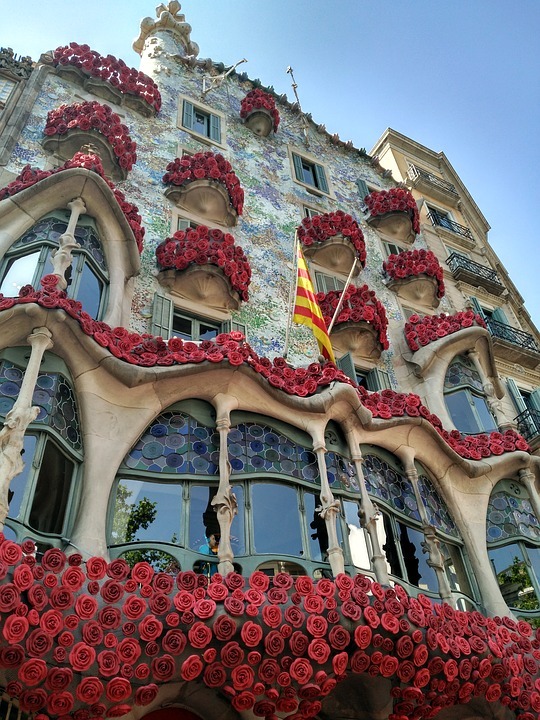 For this reason, there are two very interesting tours for these summer days, with which we can enjoy the landscapes and the culture of Barcelona (especially the gastronomic one) in a refreshing way. Barcelona has a long coast and with it a great diversity of beaches, which have been transformed throughout the years. Going through them by bicycle, discovering their history and breathing the sea breeze is something unique during the summer. ¡Now, of course! You should not forget a good sun-cream and wearing cool clothes. Close to the beaches, we can also find the most antique neighborhoods of Barcelona and they have a notable gastronomic variety, so you should not conform yourself with only one of them. The bicycle will allow us to go through these streets and stop at every one of the different terraces, in order to enjoy of a fresh drink with its respective tapa. You will get to know from the most traditional tastes to the most experimental ones. You or your stomach set the limit. The best experiences for a refreshing Barcelona!